Mahabharata thus deals with the activities of Krishna, the Supreme Person and author of the Bhagavad-gita. This gives it a unique quality. Because of Krishna’s presence, and the presence of many of his pure followers, one feels uplifted by reading the book. It soothes its readers on a deep spiritual level, bringing them closer to an understanding of the divine, and awakening a transcendental joy that surpasses all other happiness. Although from the external point of view it is a tale of conflict and intrigue among kings, demons, gods and sages, there is a deeper spiritual meaning which pervades the whole work. One can thus go on reading it again and again without it becoming stale or boring. On the contrary, one discovers different layers of meaning with each reading. 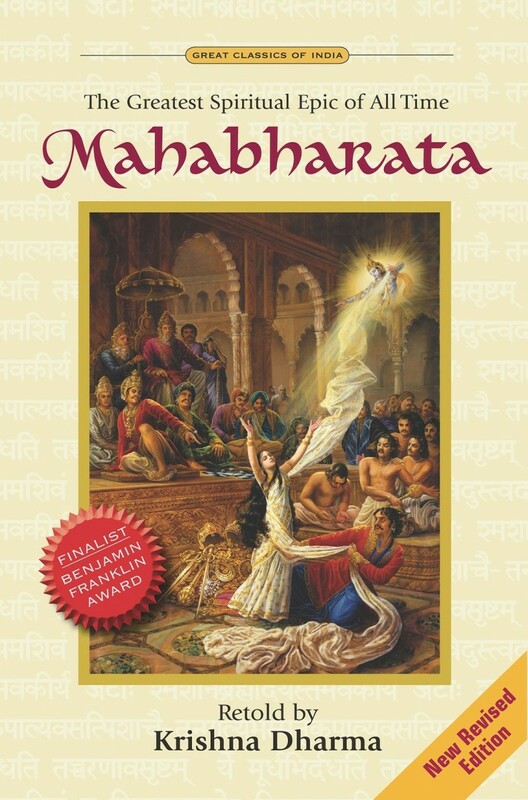 Mahabharata is a book to be treasured and passed on from generation to generation. As the writer I have simply tried to make the work easily accessible. I have remained faithful to the original, often presenting the dialogue exactly as it appeared in the Sanskrit manuscripts, but I have endeavoured to bring the text to life by the techniques of dramatisation and characterisation. I studied several translations, and cross referenced other Vedic texts for verification of detail where possible. I myself am a priest trained in the Vaishnava tradition, followers of Vishnu or Krishna, and Mahabharata is a Vaishnava text. My book is perhaps the first time that Mahabharata has been presented in English from the perspective of its original author, the sage Vyasadeva. It is suitable for a wide range of readers, from those coming new to the work, to those wishing to study it for academic purposes. I hope you find it enjoyable. I am constantly endeavouring to improve my books, and am always open to any suggestions or feedback from my readers. Those unfamiliar with Sanskrit terms (i.e. most of us) may initially find some of the names a little difficult, but do perservere, you will soon master them and when you do you will be richly rewarded by reading Mahabharata.